The 2014 sequel in the reboot series Dawn of the Planet of the Apes has a similar premise to Battle, but is not officially a remake. Told as a flashback to the early 21st century with a wraparound sequence narrated by the orangutan Lawgiver (John Huston) in "North America - 2670 A.D.", this sequel follows the ape leader Caesar (Roddy McDowall) years after a global nuclear war has destroyed civilization. In this post-nuclear society, Caesar tries to cultivate peace between the apes and the surviving humans. A gorilla general named Aldo (Claude Akins) however opposes this and plots Caesar's downfall. Caesar is married to Lisa (Natalie Trundy), the female ape of the previous film, and they have a son named Cornelius (Bobby Porter) in honor of Caesar's father. After the battle, Aldo wants to kill the penned humans, but Caesar shields them. Aldo declares that Caesar should be killed if he shields the humans. However, Virgil reveals Aldo's responsibility for Cornelius' death and the breaking of the ape community's most sacred law ("Ape shall never kill ape"). An infuriated Caesar pursues Aldo up a large tree, resulting in Aldo falling to his death during the fight. Caesar then attempts to free the humans, but they refuse to leave the pen unless humans are treated as equals. Caesar then realizes the apes are just as despicable as the former slave-owners. The apes and humans then decide to coexist with one another and begin a new society. The Lawgiver finishes his wrap-around narration (he says it's been over 600 years since the death of Caesar). It's revealed he's talking to a group of young humans and apes; apes and humans have continued to coexist in peace. When asked by a human child "Who knows about the future? ", the Lawgiver replies "Perhaps only the dead." A closeup of a statue of Caesar shows a single tear falling from one eye. DELETED SCENE: Mendez has become the new governor and talks the mutant lieutenant out of firing the atomic missile. As they argue, they discover it is the Alpha-Omega from Beneath the Planet of the Apes. Only with this sequence reinserted, the odd cut from Caesar's conversation involving the humans to the ending sequence makes more sense. Battle for the Planet of the Apes grossed a domestic total of $8.8 million, making it the lowest-grossing film in the series. However, the film went on to earn an estimated $4 million in North American theatrical rentals in 1973. ↑ Solomon, Aubrey. Twentieth Century Fox: A Corporate and Financial History (The Scarecrow Filmmakers Series). Lanham, Maryland: Scarecrow Press, 1989. ISBN 978-0-8108-4244-1. p. 257. 1 2 "Battle for the Planet of the Apes, Box Office Information". Box Office Mojo. Retrieved 2012-05-27. ↑ "Those Damned Dirty Apes!". www.mediacircus.net. Archived from the original on July 22, 2011. Retrieved 2011-08-03. ↑ Scott Mendelson (May 8, 2014). "'Dawn Of The Planet Of the Apes' Gets Plot-Heavy Trailer". Forbes. 1 2 Russo, Joe; Landsman, Larry and Gross, Edwards. Planet of the Apes Revisited. St. Martins' Griffin. August 2001. ↑ Russo, Joe; Planet of the Apes Revisited. ↑ "Family Film Producer Found Dead". The Spokesman-Review. Associated Press. June 28, 1973. Retrieved 2013-05-29. ↑ "Big Rental Films of 1973", Variety, January 9, 1974, p. 19. ↑ "Battle for the Planet of the Apes – Rotten Tomatoes". Flixster. Rotten Tomatoes. Retrieved 2013-05-29. ↑ Ebert, Roger (July 10, 1973). 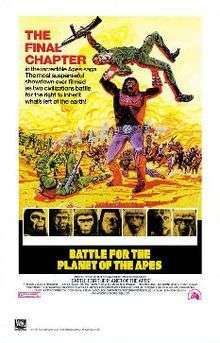 "Battle for the Planet of the Apes (1973) | Roger Ebert". Chicago Sun-Times. Retrieved 2013-05-29. ↑ Hruby, Patrick (October 10, 2012). "Tony Mendez, clandestine CIA hero of Ben Affleck's 'Argo,' reveals the real story behind film smash -". The Washington Times. Retrieved 2015-12-02.